I Love You More Than Carrots: Summer Lovin'... AP's Beachy Must Haves! As Hubs and I gear up for our next beach getaway (T-minus eight days and counting), I thought I would share some of my packing-for-the-beach must have's. It is imperative that these items accompany me to the beach each year, as I am sure I simply could not survive a week in Ocean City, Maryland without them! What's a week at the beach without sunscreen? We in the M household LOVE this sunscreen. 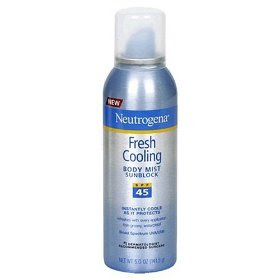 Yes, I do admit that I'm a little sun-goddess and will swipe on some Hawaiian Tropic SPF 8 at times, but only after I've generously sprayed myself down with Neutrogena's Fresh Cooling Body Mist. I love me some Helioplexes! St. Ives Apricot Scrub. There's nothing better at scrubbing away grimy sunscreen and sand after a long day on the beach than this stuff. It leaves my skin feeling silky smooth after every shower. Although, I do use it sparingly. Why? I somehow have it in my little head that if I scrub too hard, I will scrub my tan away. I know, I know. Laugh it up. But I'm serious! (Although I'm pretty sure that can't happen). I love, love, LOVE this stuff right here. 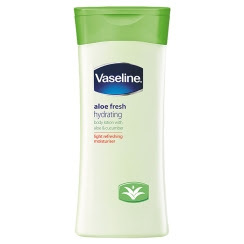 Vaseline's Aloe Fresh Hydrating lotion. Mmm, Mmm! After having divulged my fear of scrubbing away my tan in the shower, I just slather on a healthy amount of this stuff and I'm ready to head out the door! Tan included! It's light, it's fresh and doesn't leave behind any filmy, sticky residue. Coming from a girl who's bathroom cabinets look like the aisles of a CVS drugstore, this moisturizer is a must-have! Despite falling into bed with an almost full face of makeup on each night, one thing I refuse to do is wear make-up to the beach. 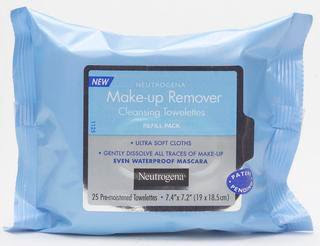 Although these Neutrogena Make-Up Removing clothes are perfect for a few swipes before hitting the hay, they also do wonders on the beach/after the beach for getting that grimy, icky, gross sunscreen film off of your face. Easy to use, easy to throw into your beach bag, these facial wipes are won-der-ful. They even come in thin travel-sized packages for easy packing. And last but certainly not least, a girl can't forget a little SPF chapstick! Along with a couple tubes of my favorite SPF chapstick, hair ties and elastic headbands, you can rest assured these items are the first to go into my suitcase. Clothes are a whole other story.. Speaking of clothes, did I mention that I've already started writing down/pairing outfits in a little notebook.. I didn't? Good. I didn't want you thinking I'm crazy.. or... anything! Happy Thursday! What are some of your Summer Must-Have's? I think we must be long-lost beach soul mates or something! Your list is so similar to mine - great beach guide! HA HA, I use the same face soap!! THANK YOU THANK YOU THANK YOU, I received your pay it forward package the other day and I love the koozie!! Too cute. And the candle smells awesome. Thanks so much for sending it!! You're the best!! St. Ives Apricot is some of the best stuff I have ever tried in the summer. And I also think you can scrub your tan away!! Love love love Neutrogena sunscreen and apricot scrub. I love a book on tape on my ipod! I haven't mastered how to lay out and read, especially on my back. we leave for rosemary beach, florida in 8 days and i cannot wait! 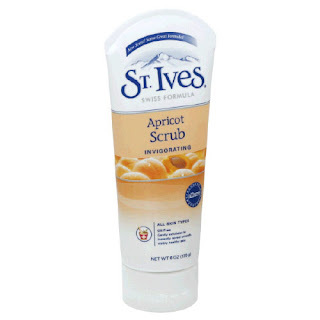 by the way, i agree, st. ive's apricot scrub is wonderful! i used to use it in college and then stopped for some reason....just started using it again two weeks ago and my skin looks great!! you're going to the beach again?! i am so jealous. I took that sunscreen to the warped tour this weekend. Worked like a charm! Just wish I'd been smart enough to put regular sunscreen on my face instead of just my moisturizer that has SPF 30.